Family background, subject choice and university have a significant impact on English students' earnings five years after graduation, new data shows. 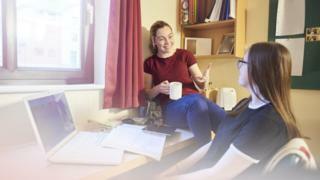 Figures compiled by the Institute for Fiscal Studies (IFS) show economics and medicine students earn about 60% more than history and English graduates. Those from the highest social groups have an 8% premium on earnings, while every A at A-level adds about 3%. The data controls for socio-economic background and prior attainment. The IFS examined the school and university exam records of graduates from England attending UK universities, alongside their tax returns. It found that, typically, graduates of physics and maths had higher earnings than those who studied subjects such as psychology and sociology. Those who studied creative arts, social care and media earned the least, about £20,000 five years after graduation. The report says that while some of the differences in earnings can be explained by differences in prior attainment and background characteristics of students, significant gaps still emerge. "We estimate studying medicine or economics increases earnings five years after graduation by more than 25% (between £6,500 and £8,400 per year) compared to studying biological sciences, history or English," the IFS says. The IFS found that some subjects, such as computing and business, where average earnings were not especially high, actually added a lot to salaries once background and A-level grades were taken into account. "For students with a weaker set of A-level grades, studying computing increases the chances of earning a relatively high salary," the report says. The data suggests Russell Group universities and pre-1992 institutions have higher earning graduates than newer institutions, with specialist arts, music and dance institutions having the lowest earning. Even after accounting for differences in students' background characteristics and prior attainment, graduates from Russell Group universities have the highest earnings. Graduates from those institutions producing the highest salaries have average earnings of around £40,000 per year for women and more than £50,000 per year for men five years after graduation. By contrast, graduates from the lowest earning institutions have average earnings below £20,000. Students from poorer backgrounds earn considerably less than their peers from richer backgrounds. Independent school students earn about 45% (£10,000) more on average five years after graduation than state-school students from poorer backgrounds. When comparing students with similar prior attainment who attended the same institution and studied the same subject, independent school students still earn 8% more. The IFS report comes as a separate study suggests fewer than two in five students think they are getting value for money. Jack Britton, senior IFS research economist, said: "Family background has an important impact on graduates' future earnings, but subject and institution choice can be even more important. "Even when comparing similar graduates, being from the highest socio-economic background adds around 8% compared to being from the lowest. "However, compared to the average degree, studying medicine or economics adds 20% to graduates' earnings, while compared to the average university, going to a Russell Group institution adds around 10%." Chris Belfield, IFS research economist, said: "Even after students know which subject they want to study, the choice of institution represents an important decision that can have significant consequences for future earnings. "For example, business degrees offer their graduates high returns on average, but there is wide variation across institutions. "For women, the top business courses offer returns of around 50% above the average degree, while the business courses with the lowest returns have returns below the average degree."